Things have been getting better for Daredevil. He's recovering well after his battle with the Hulk, his super friends have paid him some super visits, and his woman is there with him every step of the way. Even his good ol harassing pal Ben Urich is there. Daredevil let's him in and asks for a minute with Ben, as it must be important or else Ben wouldn't have come all the way to the hospital. 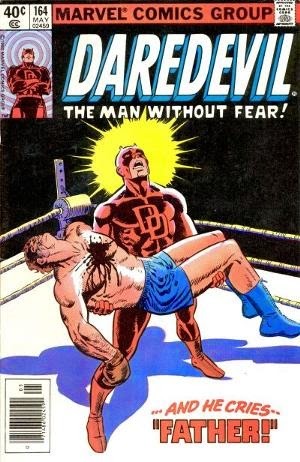 Ben presents Daredevil with evidence linking him to his true identity, Matt Murdock. Daredevil tries to play it off but eventually realizes there's no way out of it and breaks. He confesses to Ben that yes, it's all true. Matt Murdock is indeed the man without fear, Daredevil. We're then taken back all the way to Matt's youth. A brief history on his accident, and his father. A well known local boxer named Battlin' Jack Murdock. The origin from the movie is mainly the same, boxer who was down on his luck gets in with the wrong people and starts winning again, then is asked to throw a fight, doesn't, and pays dearly for it. Daredevil that night then goes on his first hunt. Dressed in the old school yellow outfit, he hunts down the men who were responsible for his fathers murder. He finds the man, who's so scared he dies of a heart attack anyway. Back in the hospital, after hearing all this, Ben decides to do Matt one solid favor. He lights a cigarette (seriously bro, in a hospital?) and proceeds to light his report on fire. All evidence is gone and now the secret is kept between Ben and Matt. He does it because he knows what Hell's Kitchen means to Matt and what would come out of it if the towns villains knew where to find him. Came in clutch Ben. This was a difference paced issue. A nice bridge going into the next story. It gave the reader a breather as we just came off of a lot of action in the last couple issues. Good solid action, a driving story, and now an emotional look on the past of some characters. This is the perfect way to write an expanding story that keeps readers invested for months and months to come. Solid job, be back in a week for more!